Over the past decade, video cameras have shrunk. As cameras have gotten smaller, so have the camera support systems used in professional production. Now, there are many substitutes for using a traditional tripod and head on location. Tripods and fluid heads are still the bread and butter support systems in most production situations, but increasingly alternative support systems are being used on jobs where traditional tripods are too big and heavy, or just not the right tool for the task. With the help of B&H Photo in New York City, here is a look at a few of the many support alternatives now available for small cameras. The numbers are growing by the day and the gear is constantly changing, adapting to the new ways tiny cameras are being used. One interesting support system are beanbags for cameras. B&H stocks more than 50 styles of beanbags from ten companies. Virtually all are low in cost and light weight. There is every size and form from companies like Apex, Kinesis, The Pod, LensCoat, Naturescapes, Novoflex, Visual Departures, Photoseiki, Tamrac and The Vest Guy. These bags are filled with materials including buckwheat, rice or poly beads. 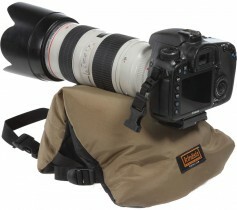 Such bags enable cameras and lenses to rest on almost any surface and are widely used in nature video to get the camera in a very low position in line with the subjects. They are also useful to steady the camera when shooting from moving vehicles. 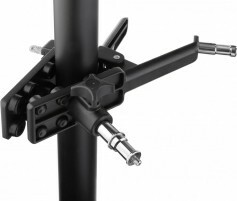 The Alladin Ball Head Clamp with ¼-inch, 20-inch screw ($22.50) is a useful support device that enables videographers to mount cameras on poles, fences, beams or railings. It weighs less than half a pound. To shoot a 360-degree radial or straight-line video or time-lapse shot with or without a tripod, the Digital Juice Orbit Dolly ($839.50) is a useful tool. 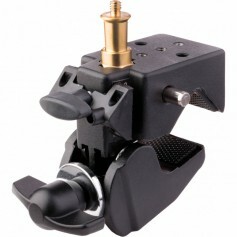 It features three-inch polyurethane casters for smooth camera movements and is machined from 0.5-inches of black powder-coated aluminum. The dolly weighs 22 pounds and can support camera systems weighing up to 300 pounds. Camera movements can be captured from ground level, or it can be attached to a tripod for shooting at higher points of view. The Dinkum Systems ten-inch ActionPod Pro ($40.45) is an A-clamp style camera support capable of supporting upright loads of up to four pounds or lateral loads of up to two pounds. 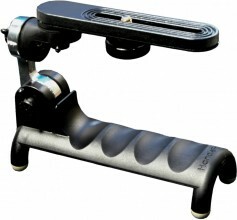 The ActionPod Pro differs from other A-clamp style supports by having a flexible seven-link gooseneck arm with a ¼-inch, 20 thread on the end to attach to the camera. 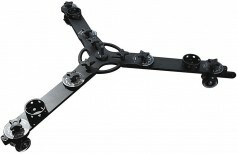 Mountable onto surfaces up to two-inches thick, its arm can be extended by adding additional three-quarter inch links to the standard ten-inch arm. It is popular with Go-Pro cameras. HandlePod’s Camera Handle/Tabletop Quadpod ($34.95) is a simple device that secures a camera to a pole, wall, countertop or other surface manually by either holding or lashing it in place using the included elastic cord. Screw a small head onto an Impact Super Clamp with T-Handle ($19.95) and the camera support can clamp onto a railing, post, 2 x 4, branch, handlebar or anything else less than an inch thick. 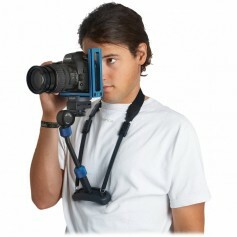 It can support camera/lens combinations weighing up to 33 pounds. The clamp features a push-release ⅝-inch hexagonal female receiver, ¼-inch, 20 threads and a ⅝-inch hex-based baby stud with ¼-inch, 20 male threads. 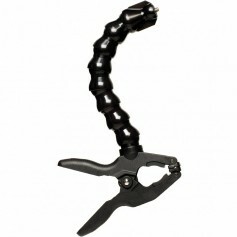 Add a set of adjustable, heavy-duty jaws to an Impact Super clamp and you get an Impact CC-125 Adjustable Gaffer Clamp ($31.95). Featuring dual baby ⅝-inch studs and rubber-coated protective jaws that can be adjusted from 0.98 to 2.55-inches, Impact’s CC-125 can be adapted to accept a tripod or head for supporting a mid to heavier weight camera/lens system (or lights) to just about anything its jaws can wrap around. Jobu Design’s Table Top Pod ($65.00) has stubby rubber legs and a ⅜-inch, 16 threaded stud at its center. Made of CNC-machined aluminum and measuring 8 x 4-inches, the videographer adds a head and the pod can firmly support a camera and lens at just above ground level or other smooth, level surface. For a larger footprint, Kirk’s Low Pod Camera Support ($160.00) measures 13.5 x 10.5-inches and features a threaded ⅜-inch stud for mounting a head. Made from aluminum, it weighs 2.15 pounds and has a carry handle for portability. 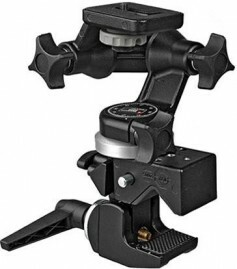 Manfrotto’s Super Clamp with 056 3-D Junior Head ($91.75) is a clamp-and-head combo that’s easy to stow away when traveling. It is handy for creating a temporary makeshift camera support when shooting on location or in the studio. 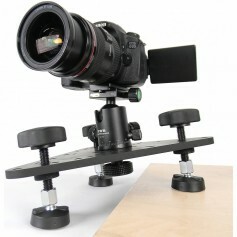 Matthews The Wedge Portable Camera Mounting Device ($177. 50) is a low-level POV camera support device. Triangular in shape with 11-inch flanks and about ⅓-inch thick, the black-finished, 6061-T6 aluminum Wedge comes with three adjustable legs with floating, self-leveling feet. The Wedge features a half-dozen each of ¼-inch, 20 and ⅜-inch holes (tapped and untapped) for adding accessories and tie-downs for securing a rig to wherever it is being mounted. There are also four centrally located riser holes for accommodating a 100mm fluid head bowl. 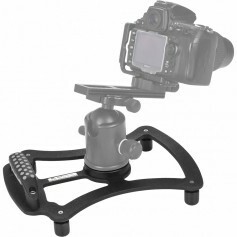 For those videographers having to use a long lens in places where tripods and monopods are forbidden or are not practical, there’s Novoflex Chestpod/Shoulder Pod ($158.99). Adjustable for a proper fit, the pod features a rubberized base that’s tucked under the sternum and a quick-release system for mounting and removal of the camera and lens. The three-point stance greatly reduces the effects of camera shake. 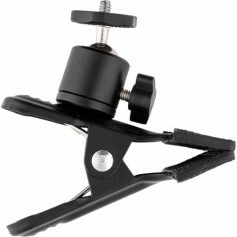 Finally, a popular ground-level POV camera support is the Platypod Pro Deluxe Kit Camera Support ($49.95). 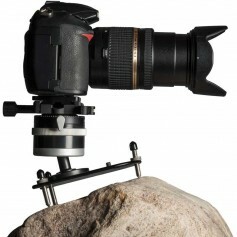 It can handle camera systems weighing up to 90 pounds when used with a sturdy tripod head. Included are a trio of threaded legs for leveling the device along with ¼-inch, 20 and ⅜-inch, 16 threaded studs. These are just a small sample of new products coming in the revolution going on in alternative camera support for smaller cameras. It’s a marketplace to watch regularly due to the extraordinary change and growth in new and innovative systems.